Grandma's natural home remedy for Diarrhea will safely and gently slow down the process while restoring fluids and nutrients, the key to recovery. First you will need to put on your detective hat! It's important to know you should never use any medications to completely stop diarrhea. Your body's immune system is what is causing this common discomfort. Your body is smarter than you think! Nothing is more comforting than a nice hot cup of tea. The most important thing to remember when having a bout of Diarrhea is drinking plenty of fluids. Drinking herbal tea can not only restore your fluids, certain kinds of herbal tea will settle your stomach, ease the cramps, and even relax you enough to allow you to get needed rest. There are many reasons we come down with Diarrhea. No matter what the reason, your body needs to get rid of whatever is upsetting your body's natural balance. You may be experiencing symptoms of a food allergy. It's possible you are having a side effect from a medication. A flu bug may be setting in your stomach or intestines. A common reason for diarrhea is food poisoning. You could have inhaled a toxic chemical. You may have finished an antibiotic and dead antibodies may have flushed into your intestines. There are times we will never find the reason. Playing detective can help, and most of the time it's just a matter of putting some pieces of the puzzle together. Ask yourself a few questions. What have you eaten, or maybe recently been exposed to? Did you recently take some kind of medication, check the label and see if Diarrhea is listed as a side effect. Where did you eat last, was the food cooked properly? Do you suffer from a common food allergy? Many times unsuspected ingredients or preservatives we are trying to avoid are in the foods we eat. If you are experiencing Chronic Diarrhea and you need fast relief try clicking on this link and using Grandma's Home Remedy for Chronic Diarrhea. Most of the time a bout of Diarrhea is nothing more than your body's way of flushing out toxins that are invading your body. When you take over the counter medication to block this process the toxins will back up in your body and cause more complicated problems down the road. After raising 6 children I can tell you simple natural home remedies for Diarrhea is the safest most effective way to bring your body back into balance. Other than spending a few days in the hospital having babies, none or our family members have ever had to be hospitalized for illness. I contribute this to using natural home remedies, herbs, and wearing the detective hat many times over the years. And of course, lots of prayers! The thought of going on a bland diet for a couple of days isn't easy but the benefits of a natural home remedy for Diarrhea is much easier than dealing with dangerous side effects of medications. Brown rice if prepared right can give your body the digestive benefits it's craving. I use a rice cooker. It's easy to prepare a large batch to make it convenient. Try putting a generous amount of olive oil and sea salt to give it a nice flavor. Store the extra brown rice in a container to reheat in the microwave for a minute or two when needed. For infants suffering from Diarrhea try boiling some rice in extra water, drain the rice, and use the rice water in their bottle to relieve not only diarrhea but also to relax an upset stomach. Don't use bleached white rice! It's nothing but starch and you won't get the benefits you are looking for. Give yourself or your patient a generous bowl of brown rice every four hours, make 6 small meals, during the time you would normally eat or have a snack. There is no need to do this round the clock. Plenty of rest is another natural home remedy for Diarrhea. Like I said earlier, it's important to drink plenty of fluids. Stay away from dairy products. Try to limit your fluids to clear liquids. 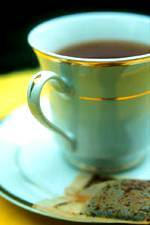 Use Herbal, Green or Black Tea, do not add dairy or artificial sweetner, you can add honey or sugar to sweeten! 7UP, Ginger Ale, and Spring Water are also the best fluids to flush through your system without harsh effects. Stay away from all juices! It's best to keep the 7UP and Ginger Ale at room temperature. Don't worry about it going flat, sometimes it's easier on the stomach if the fizz is out. Another very important home remedy for Diarrhea is, ripe bananas. When you combine brown rice, a clear fluid of your choice, and ripe bananas, you will give your body exactly what it needs to clean out the bowl, while restoring your strength and health. 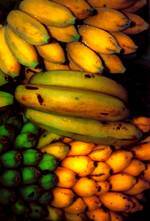 Bananas are an excellent source of potassium, easily digested, and very convenient. When dealing with a bout of Diarrhea it's extremely important to replenish the potassium your body is losing. Besides all the nutritional benefits of bananas, they taste so good! Children don't have a clue it's a home remedy for Diarrhea. When one of my sons was an infant, two month old, he was having chronic Colic problems and severe Diarrhea. Luckily he had an old fashioned Pediatrician. He quickly diagnosed dairy allergy. At that time baby formula was made from dairy. We weren't lucky enough to have a choice of Soy Formula in those days. He put my son on a diet of nothing but smashed bananas and 7UP. Of course this scared me to death with an infant on this kind of diet at that age, but I followed his instructions. The 7UP had to be kept at room temperature and flat, (all the fizz had to be taken out of it). The bananas had to be very ripe, mashed and whipped, like baby food. The diet worked like a charm. Of course there are times when Diarrhea reaches a dangerous stage, especially in children or the elderly. If you try this home remedy for Diarrhea and after a couple of days it isn't helping, consult your Medical Provider. It's time to get professional advice if you notice a High Fever developing, Extreme Weakness, or unable to take fluids. You may be dealing with a serious infection. Watch Your Diet During Recuperation! Another great way to stay away from dairy is to keep a supply of Soy Milk and Rice Milk on hand for when you start recuperating from Diarrhea. Slowly introduce food back into your diet. Start slowly with a bowl of light cereal, like Puffed Rice or Corn Flakes. Cold Rice Milk tastes great on any kind of cereal. Why not slice a banana on top? For lunch try a nice hot bowl of good old Chicken Soup? You might add some Saltine Crackers, the soda in the crackers will help keep your stomach settled. If all goes well during these meals, your ready to enjoy a balanced dinner with a small amount of meat and vegetable, but I'd still add some brown rice on the side. Stay away from salads, dairy, and strong tasting condiments, like onions. Remember to keep your meals simple and easy to digest. Within no time this natural home remedy for Diarrhea will have your body back in balance. Best of all, you won't have to worry about any dangerous side effects!